“The Adventures of Sherlock Holmes” is a compilation the first 12 Sherlock Holmes mysteries published in Strand Magazine by Sir Arthur Conan Doyle. In these stories, Holmes is visited by a variety of people who are in need of his help. Holmes shows no favoritism. 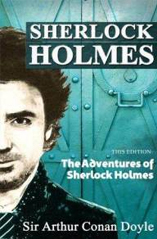 Whether his clients are penniless working-class individuals or wealthy political figures, Holmes enjoys solving their puzzles and working on the side of good rather than evil. In this collection, Holmes helps royalty involved in a blackmailing plot in “A Scandal in Bohemia.” In “The Red Headed League,” Holmes foils a plot to rob a bank. Throughout this anthology, Holmes and his assistant, Dr. Watson, resolve cases of mistaken identity, theft and even murder. Holmes is not the type of detective who sneaks around with a pistol interrogating people. Although he will go to the scene of the crime and interview witnesses, the majority of his investigational work is conducted in his own mind. The amazing thing about Holmes is that he notices things that others miss. By doing so, he puts together the pieces of mysteries, formulating solutions that would never occur to anyone else.